B Sc with CBZ/ PCM with 45% marks in aggregate. Course contents: Organic chemistry, analytic chemistry, inorganic chemistry, physical chemistry, spectroscopy and chromatography, etc. The word “Chemistry” itself is a wide term. It provides a large platform for job and research opportunities. With a degree in chemistry, you can touch any field that is related to chemistry, i.e., industrial chemistry, pharmaceutical chemistry, synthetic and natural product chemistry, etc. 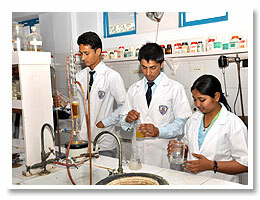 A good chemist has a good hold on instrumentation, simple analytical procedures, drug designing and its development. On pursuing this course one can enter in the world of chemical science involving various kinds of developments, creativity and job opportunity in the following areas: polymer industry, paper and pulp industry, dye industry, pharmaceutical and paint industries, etc. In various reputed chemical industries and research organizations like ONGC, Indian oil and other oil and petrochemical industries, food and fertilizer industries, seed development industries and various mineral and material sciences. Faculty positions in engineering colleges, PG Science colleges, biomedical / paramedical colleges, etc. are also available. Hostel, Transport & Mess fee: Rs. 65,000/- p.a. to be paid in two equal installments. However, vacating hostel not allowed in middle of an academic session (room rent non-refundable, mess charges on prorata basis). Laundry charges: Rs. 250/- per month.